10 A None No Power Seat 10 A is a standard Economy Class seat that is missing a window. American designates this seat as a Preferred Seat, which is reserved for AAdvantage elite members. An extra charge is required to book this seat otherwise. 10 B None No Power Seat 10 B is a standard Economy Class seat. American designates this seat as a Preferred Seat, which is reserved for AAdvantage elite members. An extra charge is required to book this seat otherwise. 10 C None No Power Seat 10 C is a standard Economy Class seat. American designates this seat as a Preferred Seat, which is reserved for AAdvantage elite members. An extra charge is required to book this seat otherwise. 10 D None No Power Seat 10 D is a standard Economy Class seat. American designates this seat as a Preferred Seat, which is reserved for AAdvantage elite members. An extra charge is required to book this seat otherwise. 10 E None No Power Seat 10 E is a standard Economy Class seat. American designates this seat as a Preferred Seat, which is reserved for AAdvantage elite members. An extra charge is required to book this seat otherwise. 10 F None No Power Seat 10 F is a standard Economy Class seat. American designates this seat as a Preferred Seat, which is reserved for AAdvantage elite members. An extra charge is required to book this seat otherwise. 11 A None No Power Seat 11 A is a standard Economy Class seat that has a misaligned window. American designates this seat as a Preferred Seat, which is reserved for AAdvantage elite members. An extra charge is required to book this seat otherwise. 11 B None No Power Seat 11 B is a standard Economy Class seat. American designates this seat as a Preferred Seat, which is reserved for AAdvantage elite members. An extra charge is required to book this seat otherwise. 11 C None No Power Seat 11 C is a standard Economy Class seat. American designates this seat as a Preferred Seat, which is reserved for AAdvantage elite members. An extra charge is required to book this seat otherwise. 11 D None No Power Seat 11 D is a standard Economy Class seat. American designates this seat as a Preferred Seat, which is reserved for AAdvantage elite members. An extra charge is required to book this seat otherwise. 11 E None No Power Seat 11 E is a standard Economy Class seat. American designates this seat as a Preferred Seat, which is reserved for AAdvantage elite members. An extra charge is required to book this seat otherwise. 11 F None No Power Seat 11 F is a standard Economy Class seat that has a misaligned window. American designates this seat as a Preferred Seat, which is reserved for AAdvantage elite members. An extra charge is required to book this seat otherwise. 12 A None No Power Seat 12 A is a standard Economy Class seat. American designates this seat as a Preferred Seat, which is reserved for AAdvantage elite members. An extra charge is required to book this seat otherwise. 12 B None No Power Seat 12 B is a standard Economy Class seat. American designates this seat as a Preferred Seat, which is reserved for AAdvantage elite members. An extra charge is required to book this seat otherwise. 12 C None No Power Seat 12 C is a standard Economy Class seat. 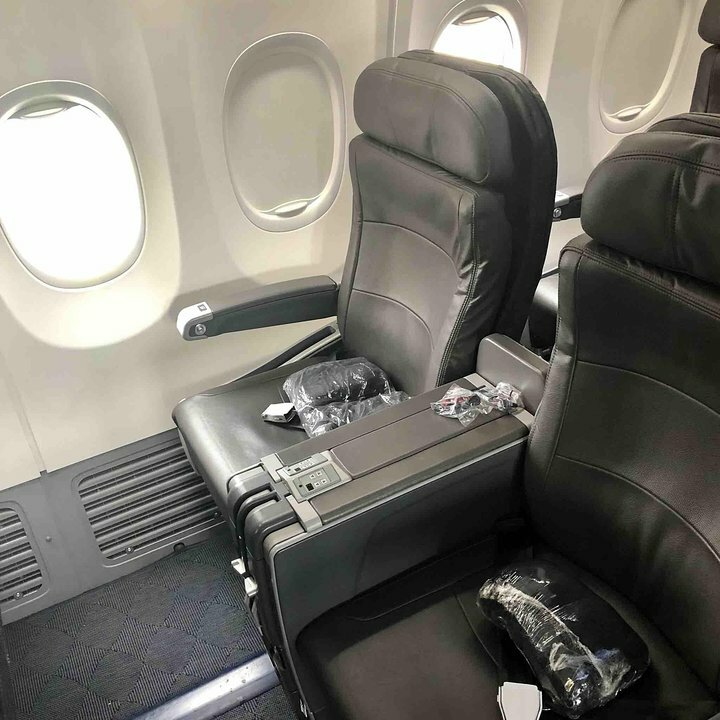 American designates this seat as a Preferred Seat, which is reserved for AAdvantage elite members. An extra charge is required to book this seat otherwise. 12 D None No Power Seat 12 D is a standard Economy Class seat. 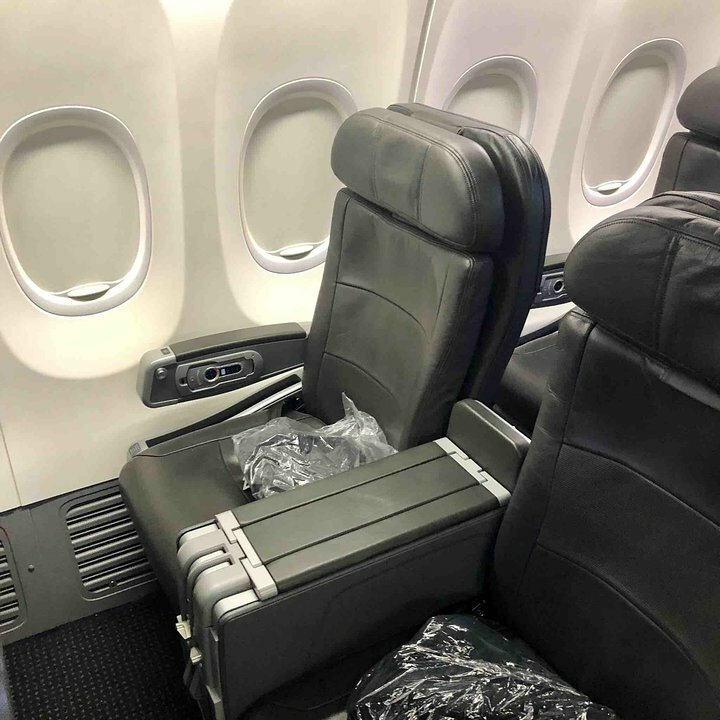 American designates this seat as a Preferred Seat, which is reserved for AAdvantage elite members. An extra charge is required to book this seat otherwise. 12 E None No Power Seat 12 E is a standard Economy Class seat. American designates this seat as a Preferred Seat, which is reserved for AAdvantage elite members. An extra charge is required to book this seat otherwise. 12 F None No Power Seat 12 F is a standard Economy Class seat. American designates this seat as a Preferred Seat, which is reserved for AAdvantage elite members. An extra charge is required to book this seat otherwise. 13 A None No Power Seat 13 A is a standard Economy Class seat that may not recline due to the exit row behind. American designates this seat as a Preferred Seat, which is reserved for AAdvantage elite members. An extra charge is required to book this seat otherwise. 13 B None No Power Seat 13 B is a standard Economy Class seat that may not recline due to the exit row behind. American designates this seat as a Preferred Seat, which is reserved for AAdvantage elite members. An extra charge is required to book this seat otherwise. 13 C None No Power Seat 13 C is a standard Economy Class seat that may not recline due to the exit row behind. American designates this seat as a Preferred Seat, which is reserved for AAdvantage elite members. An extra charge is required to book this seat otherwise. 13 D None No Power Seat 13 D is a standard Economy Class seat that may not recline due to the exit row behind. American designates this seat as a Preferred Seat, which is reserved for AAdvantage elite members. An extra charge is required to book this seat otherwise. 13 E None No Power Seat 13 E is a standard Economy Class seat that may not recline due to the exit row behind. American designates this seat as a Preferred Seat, which is reserved for AAdvantage elite members. An extra charge is required to book this seat otherwise. 13 F None No Power Seat 13 F is a standard Economy Class seat that may not recline due to the exit row behind. American designates this seat as a Preferred Seat, which is reserved for AAdvantage elite members. An extra charge is required to book this seat otherwise. 14 A None No Power Seat 14 A is a standard Economy Class seat located in an Exit Row. The seat is designated as a Main Cabin Extra seat, features additional legroom, and may be selected for an additional fee. There is additional personal space due to the recline restriction of the seat in front. The tray table is in the armrest, making the armrest immovable and slightly reducing seat width. 14 B None No Power Seat 14 B is a standard Economy Class seat located in an Exit Row. The seat is designated as a Main Cabin Extra seat, features additional legroom, and may be selected for an additional fee. There is additional personal space due to the recline restriction of the seat in front. The tray table is in the armrest, making the armrest immovable and slightly reducing seat width. 14 C None No Power Seat 14 C is a standard Economy Class seat located in an Exit Row. The seat is designated as a Main Cabin Extra seat, features additional legroom, and may be selected for an additional fee. There is additional personal space due to the recline restriction of the seat in front. The tray table is in the armrest, making the armrest immovable and slightly reducing seat width. 14 D None No Power Seat 14 D is a standard Economy Class seat located in an Exit Row. The seat is designated as a Main Cabin Extra seat, features additional legroom, and may be selected for an additional fee. There is additional personal space due to the recline restriction of the seat in front. The tray table is in the armrest, making the armrest immovable and slightly reducing seat width. 14 E None No Power Seat 14 E is a standard Economy Class seat located in an Exit Row. The seat is designated as a Main Cabin Extra seat, features additional legroom, and may be selected for an additional fee. There is additional personal space due to the recline restriction of the seat in front. The tray table is in the armrest, making the armrest immovable and slightly reducing seat width. 14 F None No Power Seat 14 F is a standard Economy Class seat located in an Exit Row. The seat is designated as a Main Cabin Extra seat, features additional legroom, and may be selected for an additional fee. There is additional personal space due to the recline restriction of the seat in front. The tray table is in the armrest, making the armrest immovable and slightly reducing seat width. 15 A None No Power Seat 15 A is a standard Economy Class seat located in an Exit Row. The seat is designated as a Main Cabin Extra seat, features additional legroom, and may be selected for an additional fee. There is additional personal space due to the recline restriction of the seat in front. The tray table is in the armrest, making the armrest immovable and slightly reducing seat width. 15 B None No Power Seat 15 B is a standard Economy Class seat located in an Exit Row. The seat is designated as a Main Cabin Extra seat, features additional legroom, and may be selected for an additional fee. There is additional personal space due to the recline restriction of the seat in front. The tray table is in the armrest, making the armrest immovable and slightly reducing seat width. 15 C None No Power Seat 15 C is a standard Economy Class seat located in an Exit Row. The seat is designated as a Main Cabin Extra seat, features additional legroom, and may be selected for an additional fee. There is additional personal space due to the recline restriction of the seat in front. The tray table is in the armrest, making the armrest immovable and slightly reducing seat width. 15 D None No Power Seat 15 D is a standard Economy Class seat located in an Exit Row. The seat is designated as a Main Cabin Extra seat, features additional legroom, and may be selected for an additional fee. There is additional personal space due to the recline restriction of the seat in front. The tray table is in the armrest, making the armrest immovable and slightly reducing seat width. 15 E None No Power Seat 15 E is a standard Economy Class seat located in an Exit Row. The seat is designated as a Main Cabin Extra seat, features additional legroom, and may be selected for an additional fee. There is additional personal space due to the recline restriction of the seat in front. The tray table is in the armrest, making the armrest immovable and slightly reducing seat width. 15 F None No Power Seat 15 F is a standard Economy Class seat located in an Exit Row. The seat is designated as a Main Cabin Extra seat, features additional legroom, and may be selected for an additional fee. There is additional personal space due to the recline restriction of the seat in front. The tray table is in the armrest, making the armrest immovable and slightly reducing seat width. 3 A None No Power Seat 3 A is a standard First Class seat, however the position of the bulkhead may be bothersome. There is no floor storage for this seat during take-off and landing. 3 B None No Power Seat 3 B is a standard First Class seat, however the position of the bulkhead may be bothersome. There is no floor storage for this seat during take-off and landing. 3 E None No Power Seat 3 E is a standard First Class seat, however the position of the bulkhead may be bothersome. There is no floor storage for this seat during take-off and landing. 3 F None No Power Seat 3 F is a standard First Class seat, however the position of the bulkhead may be bothersome. There is no floor storage for this seat during take-off and landing. 30 A None No Power Seat 30 A is a standard Economy Class seat in the last row of the plane. The proximity to the lavatories and galleys may be bothersome. 30 B None No Power Seat 30 B is a standard Economy Class seat in the last row of the plane. The proximity to the lavatories and galleys may be bothersome. 30 C None No Power Seat 30 C is a standard Economy Class seat in the last row of the plane. The proximity to the lavatories and galleys may be bothersome. 30 D None No Power Seat 30 D is a standard Economy Class seat in the last row of the plane. The proximity to the lavatories and galleys may be bothersome. 30 E None No Power Seat 30 E is a standard Economy Class seat in the last row of the plane. The proximity to the lavatories and galleys may be bothersome. 30 F None No Power Seat 30 F is a standard Economy Class seat in the last row of the plane. The proximity to the lavatories and galleys may be bothersome. 6 A None No Power Seat 6 A is a standard First Class seat that does not recline due to the bulkhead behind. 6 B None No Power Seat 6 B is a standard First Class seat that does not recline due to the bulkhead behind. 6 E None No Power Seat 6 E is a standard First Class seat that does not recline due to the bulkhead behind. 6 F None No Power Seat 6 F is a standard First Class seat that does not recline due to the bulkhead behind. 7 A None No Power Seat 7 A is a standard Main Cabin Extra seat that passengers have reported as having limited legroom due to the position of the bulkhead. The tray tables are in the armrests, making the armrests immovable and slightly reducing seat width. There is no floor storage for this seat during takeoff and landing. Also, overhead storage space may be limited as the bin above this row is often reserved for aircraft equipment. 7 B None No Power Seat 7 B is a standard Main Cabin Extra seat that passengers have reported as having limited legroom due to the position of the bulkhead. The tray tables are in the armrests, making the armrests immovable and slightly reducing seat width. There is no floor storage for this seat during takeoff and landing. Also, overhead storage space may be limited as the bin above this row is often reserved for aircraft equipment. 7 C None No Power Seat 7 C is a standard Main Cabin Extra seat that passengers have reported as having limited legroom due to the position of the bulkhead. The tray tables are in the armrests, making the armrests immovable and slightly reducing seat width. There is no floor storage for this seat during takeoff and landing. Also, overhead storage space may be limited as the bin above this row is often reserved for aircraft equipment. 7 D None No Power Seat 7 D is a standard Main Cabin Extra seat that passengers have reported as having limited legroom due to the position of the bulkhead. The tray tables are in the armrests, making the armrests immovable and slightly reducing seat width. There is no floor storage for this seat during takeoff and landing. Also, overhead storage space may be limited as the bin above this row is often reserved for aircraft equipment. 7 E None No Power Seat 7 E is a standard Main Cabin Extra seat that passengers have reported as having limited legroom due to the position of the bulkhead. The tray tables are in the armrests, making the armrests immovable and slightly reducing seat width. There is no floor storage for this seat during takeoff and landing. Also, overhead storage space may be limited as the bin above this row is often reserved for aircraft equipment. 7 F None No Power Seat 7 F is a standard Main Cabin Extra seat that passengers have reported as having limited legroom due to the position of the bulkhead. The tray tables are in the armrests, making the armrests immovable and slightly reducing seat width. There is no floor storage for this seat during takeoff and landing. Also, overhead storage space may be limited as the bin above this row is often reserved for aircraft equipment. 8 B None No Power Seat 8 B is a standard Main Cabin Extra seat. 8 E None No Power Seat 8 E is a standard Main Cabin Extra seat. 9 A None No Power Seat 9 A is a standard Main Cabin Extra seat that has a misaligned window. 9 B None No Power Seat 9 B is a standard Main Cabin Extra seat. 9 E None No Power Seat 9 E is a standard Main Cabin Extra seat. 9 F None No Power Seat 9 F is a standard Main Cabin Extra seat that has a misaligned window. A variety of music selections are available and accessed through the seat back inflight entertainment monitor or personal portable devices, depending on which version you are on. A variety of films, television shows, documentaries, and games are available for viewing. All may be accessed through the seat back inflight entertainment monitor or personal portable devices, depending on which version you are on. Personal 110v power ports are offered at all seats in First and Main Cabin Extra and shared between seats in Economy. This Boeing 737-800 seats 160 passengers and is primarily used on domestic routes. This aircraft features 16 First Class recliner seats, 30 Main Cabin Extra seats, and 114 standard Economy Class-style seats in the Main Cabin. This aircraft reflects an upgraded interior featuring Main Cabin Extra seating. Main Cabin Extra seats will be located in the front portion of the Main Cabin allowing easier boarding and deplaning. Customers traveling in Main Cabin Extra seats will enjoy four to six inches of extra leg room compared to a standard Main Cabin seat as well as priority boarding privileges. Inflight entertainment is provided through a seat back inflight entertainment monitor or your personal portable devices, depending on which version you are on. 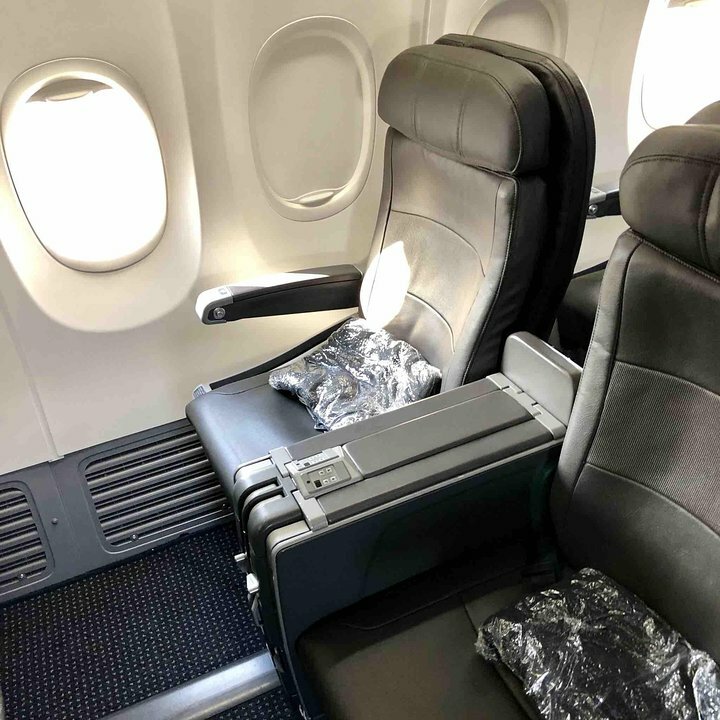 Members have reported that on versions with seat back inflight entertainment monitors that all B, C, D and E seats may have resticted underseat storage and legroom due to the position of an entertainment equipment box. This seat was narrower than the seat next to me. I paid for seat upgrade but AA did not honor it. They moved me to this seat so I did not get to sit next to my wife. I am 6 feet 215 lbs. I was not comfortable but at least I was toward the front of the plane. I had to bend down to look out the window. The window location did provide a bit more shoulder room. I think AA has gone to far on reducing seat width and spacing. I just would not recommend this plane. I paid the same price for upgrade on an Airbus A321 and was way more comfortable and actually got the amenities paid for. All seats on this 737-800 plane are very uncomfortable. The seat cushion is very thin and does not provide adequate support, specially on long flights. This plane is used for coast to coast travel, so bring your own seat cushion (BYOC). 7A is extremely narrow as because of the bulkhead as well as the window being misaligned the window support reduces your shoulder space. Extremely uncomfortable. DO NOT! and I repeat DO NOT! book this seat. Absolutely the worse seat I have ever sat in on AA. First of all you are going to pay extra to get a few inches for leg room. Not true, in this seat you have a wall in from of you and no way to stretch your legs, like you could in the seats behind you. Oh, by the way, no more tv's. Only ceiling monitors. So, bring ear plugs or read lips. One more thing, no snacks were given out and in this seat you can smell the food being served in business class. Listed as cautionary but is truly a BAD seat. Some idiot at Boeing or American deciced to put half an armrest attached to the seat that jabs into your back/side constantly. It also reduces sear width since it almost 3 inches from the fuselage unlike regular seats. No need for it. What a pain. Mark It Red! The armrest tray is less than 6" wide, no tray in front, AND the seat does recline, 1/8". Never offered anything to eat, pay or no pay, got one lousy diet coke. Six hours of misery. The two lavatories had baby poop smeared everywhere while the four attendants sat in their seats for almost the entire trip. By the way the air vents give out only a breath of air. Misery. Row 8 seats behind bulkhead row, thus the leg room/floor space is greatly reduced in the middle row and slightly reduced in the window row, due to placement of stored bulkhead tray tables. The tray tables are stored in a metal housing under the bulkhead row seats. The middle seat has 2 trays stored in their floor space. The window row has 1 tray stored in their floor space. The aisle seat is not affected. I have to disagree with those who are complaining about Row 7. This row has exceptional legroom due to the distance between the row and the barrier separating First Class from coach. If the tray tables in the armrests make the seats any less wide than Rows 8 or 9, it is imperceptible. I sat in 8D on the return trip and wished I was back in Row 7. I am very disappointed that AA is planning to remove the video monitors from its planes. I love using them and am always glad to see them when I board. It is MUCH nicer than using a laptop. Can't believe row 7 is being sold as premium seating. Paid $70 for seat 7A and got none of the perks touted. Boarded in group 5 and the overhead bin space was already full. Because of the bulkhead, there's no seat in front of you so you also have to find overhead bin space for your personal bag, typically in a row behind your seat (which means waiting for everyone to deplane before you can retrieve it). Can't stretch out because of the bulkhead, and the tray table is in the armrest so less width too. Just 1 chance to request the "free drinks" when the cart goes by. Would have been better off sitting in the back of the plane. This should not be sold as a Main Cabin Extra seat. The bulkhead limits legroom to less than a regular seat. There is probably a little extra space to get in and out, but my row mates still had to get up. The tray table was not very stable since it came from the armrest. There is no place to stow your carry on, either. I would not choose this seat again, and I certainly wouldn't pay extra for it. This felt like less leg room than the standard seats and with limited shortage it was not worth the upgrade fee. Even though this is the last row of first class the seat does recline. The bottom of the seat slides forward a bit and the back reclines. Comfy and good seat. Flew to Boston direct on this airplane and the IFE is the only thing I can say worked better then expected. It was touchscreen capable and worked pretty well. It has a headphone jack and a USB port. Paired with Bose noise cancelling headphones it was great. The seat itself is nothing to write home about. Uncomfortable (standard) and cramped but that's what you get in economy. Not sure if main cabin extra would be worth it? The exit rows however are not, the width of the seat is reduced significantly which does not make up for extra leg room. Flight attendants were great and we didn't crash so I consider that a win! 10A is simply horrible, as pointed out by the others. The out of phase window creates a convexity that cramps you horribly. I regretted switching from my regular coach seat, and it is astonishing that AA would charge $$ for this seat! The protruding seam for wall/window panels is exactly where my shoulders were, so it cramped comfortable space significantly. Terrible exit row seat. Seat divider holds the tray table and does not move resucing seat width. The side panel comes further into cabin due to emergency window severely reducing space for your right side. You will be in an uncomfortable contorted position but with plenty of leg room. I heard AA is removing TV screens from seatbacks, so not sure if the config was old or new - this one did had TVs. Leg room was sufficient - much better than the window seat on the config without seatback TVs. Still, felt a bit tight when the seat in front reclines. Nicer tray table - folded in half, which was a big help with the reclined seat reducing space. Flying ORD-LGA, the seat was sufficient and felt much better than the previous leg I flew on the a/c without seatback TVs. Tray tables in all the exit rows are in the arm reats making the seats more narrow and arm rests fixed. The tray tables in all Exit Row seats are in the armrest, making armrests immovable and reducing seat width. Newer plane, from 2016. This economy seat is very nice, features IFE. Lots of different bells and whistles. Inflight magazine is hidden behind tray table, which folds in half. Has AC power, and a USB and headphone jack on IFE screen. Seats are a bit too upright in non-reclined position, and the legroom is mediocre. The IFE did respond to touching well, though. Seat has been narrowed by tray in armrest. Right arm rest is shorter than the left and is uncomfortable. Decent seat, but the window is off center. Not the worst (little bit of wall comes in handy for naps) but nkt ideal. Seat DOES recline and was comfortable leather. Equipment box under all the first class aisle seats partially limited width of legroom area, but was adequate after I stored my backpack up above, instead of under the seat. They moved over the divider slightly into the window seat area, so both seats have same amount of legroom. Good seat pitch and no problem when the person in front of me reclined. Crew on this flight from ORD to SFO was efficient and pleasant. Lunch was OK.
On a 737-800, there is a fixed "stub" armrest on the window side that significantly reduces seat width. The armrest between 15A and 15B is a typical exit row armrest that contains the tray table, further reducing seat width. I would rate this a yellow, not a green. Is it me, or are the seats & space getting smaller? Terribly uncomfortable for a 4+ hour flight with a large man in 11D working on his laptop the entire time. 15" from my nose to the seat in front when that passenger reclined. The best part about this seat was being able to get out of it faster than if we were further back on the plane. 1579 ORD->BDL. This is not a preferred seat; it's regular economy (along with the rest of row 13). IFE good video quality but the audio jack required a lot of fiddling with in order for it transmit sound, in the end I had to hold my headphone jack with my hand in order to hear the sound well. I liked the HUD map. The legroom was fine to me at 5'10". The tray table has a full and half table configuration (it folds in half) which is nice. Seat is the worst. The extra leg room doesnt cone close to making up for the 1/2 arm rest (really!). It has fixed armrest so you need to be very thin to be comfortable. I avoid AA as much as possible due to their seating set-up in general. 7C on the bulk head has two issues, first the dividing wall goes all the way down so there's not space in front to stretch you legs - so hopefully there's overhead bin space to put your single carry on. Second the seats have hard sides (not open) and are narrow - I'm not terribly large (about a size 14/16 ladies) and wondered if I'd fit. Any person with sizeable hips would not be able to squish into this seat. Avoid this is you have any bottom. For my experience it was true that the leg room was decent but I am short sooo... the seat is incredibly narrow and can be painful if even slightly overweight. In the amenities section of seat guru it says there is video entertainment at every seat, it was not available on any economy seat in my area. 3-22-2018 For a middle seat, I found it to be comfortable. I am 5'6"and had plenty of leg room. The seat is a reclining seat and has a fold down lap tray. A small screen tv was viewable from this seat. There is room to store a small carry on under the seat in front. No plane noise. Plenty of leg room. Seats are a bit cramp with the tray tables in armrests. At least it's relatively new re: seatback entertainment and power ports -- a plus. HOWEVER: A continuing mystery why so much foot space is taken up with equipment boxes, and yet we are asked repeatedly to put carry-on non-rollaboards down there. Both sides of the footspace for the middle seat in this row (didn't check others) are shrunk by such a box, leaving me with not quite enough space for my feet, never mind a briefcase. Also, not seat-related, but we were supposed to be able to purchase breakfast and no one came around to take orders -halfheartedly - until the very last hour of the flight. Unsurprisingly, no one ordered anything. Air circulation isn't great either, even with the new controls -- the lady next to me almost fainted and we were so jammed in that she really couldn't even begin to get her head between her knees. American needs to reclaim some idea of human decency toward its coach passengers. This seat (10A) has to be the worst seat I have ever sat in, on any airline including Spirit and Frontier. The lack of window is more than annoying, it also makes for less shoulder room so it is incredibly tight and claustrophobic. Misaligned window seat makes the arm room signifcantly less. There is a decent amount of legroom in 7D - I would rate the seat "green". This is because there bulkhead wall doesn't extend all the way to the aisle. Therefore you can stretch your legs under about 1/2 the first class seat in front of the bulkhead wall. I don't understand how American can call this a preferred seat. As a 'million-miler' at least I didn't have to pay for the privilege of sitting in a seat that has an obstruction of some kind under the seat in front of it that precludes extending one's legs straight ahead. Rather, I had to sit at an angle for the entire flight between Palm Beach / PBI and Chicago's ORD the other day. It was most uncomfortable; but - then, that seems to be the way American's going; the new CEO that came over from US Airways in the post merger appearing to want to down-grade American to compete with Spirit's market-demographic. Flew AA between Chicago's ORD and Palm Beach's PBI twice in the past week; unfortunately - for me, I was booked on the sole daily non-stop between these two airports on American and on their 737-800 in 10A southbound, which is considered a 'preferred seat' at/by/ American - at least I didn't have to pay extra for it as a 'Million-Miler.' Because the seat has no window the customary 3-4 indentation for the concave window area isn't there and the interior wall extends into the row/seat by 3-4 inches. In my case that mean't that I my left shoulder was pressed up against the cabin's interior wall the entire flight and I, in turn, angled to my right the entire time I was on board. Additionally, the space between my seat and that of the seat in the row in front of me meant that when the passenger in front of me put his seat-back back I couldn't lower my tray-table to anything approaching level, even to rest a beverage upon without it sliding forward. Simply, avoid this seat! Starting on Row 10 and going a few rows back (maybe 5) there are no windows on this side of the plane. On the DEF side of the plane these rows all had windows. This makes no sense to me. Why is this? The seat was very uncomfortable. Please note that if you have a long flight, there is no seat entertainment. It is central entertainment. Limited legroom due to bulkhead wall. 7D and 7C are the only good seats in this row. Access to window though. This seat and all 'B' and 'E' Main Cabin Extra seats have narrow underseat storage and foot room due to 2 - 5" (10" total reduced space) utility boxes mounted under these seats. I will try to add a photo. Arm rests dont move and leg room is a little tight due to the bulkhead. Great legroom in exit row 14. However, the padding on the exit row window seat is cut-down to help egress. Feels like sitting on a bleacher seat. Seat 7A is encroached by the fuselage wall, especially if you are 5'10" or over. For a 3.5 hour trip to SJU, it was more unpleasant than pleasant. The 35-37" legroom estimated is more like 34". My knees were clear of the seat pocket, however the impressive PTV was unwatchable with 7C reclined for 95% of the flight, as the TV screen cannot be tilted the headrest was about 6" in front of my face. The seat itself was on the thin side but not unbearable. Movable armrests in this row, unlike 7 which had immovable ones with the trays in the armrest. Nothing special, decent view out window, this plane has overhead IFE. Horribly uncomfortable seat. I'm 6'2, 175lbs, had to sit completely upright because my knees were in the back of the seat in front of me. It was like sitting on a park bench for 2 hours. I've never had such an uncomfortable flight in my life. The fact that they want to charge you $64 for the same seat with an extra 2" of leg room is just insulting. This would need to be $100+ cheaper than anything else for me to fly again on a short flight. I'll stay home for anything longer. I'm 5'10" and mostly leg, and the bulkhead really restricts legroom. No pouch on the bulkhead, either, so anything not in your bag in the overhead has to be in your lap. The aisle in row 7 is the only place to be, because you can at least stretch out one leg, when there's no carts or passengers going by. Not a great seat for a 4 hour flight. Avoid this plane if you can. The seats feel like you are sitting on a bench. There is no under-seat storage due to the entertainment boxes. My handbag took up all the room and I had no where to put my feet. The plane was HOT! The vents for the aisle seat are over the window seat. The air never reaches and you cant reach to adjust. First class does not have recliner seats. If you try to recline,the seat forces you to slouch in a hard shell. No extra room, just forced slouching. Food:awful, Fly coach and bring a sandwich. Why are there no additional jumbo jets to Chicago? Why was I charged more for these seats? No luggage connection with BA flight. First class passengers had to claim and carry our own luggage (even checked-in baggage) over to BA in the international terminal. No help or offer of help from American "ground support." Great incentives to fly other airlines. While the seat was pretty supportive and spacious, the IFE system puts two(!) boxes underneath the seat in front. There was no space at all for my bag and made me twist my feet in order to stretch out my legs. More room for feet on the aisle and window seats. for a 6'1 250lbs guy the paid upgrade to Main Cabin Extra was well worth it. the extra leg room was enough to fully stretch my legs under the seat in front front of me. 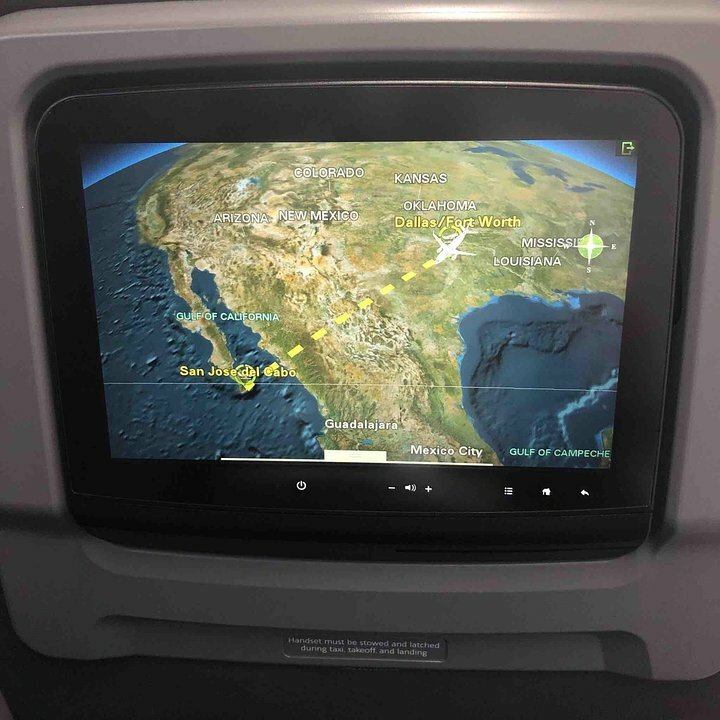 my first flight had over head screens so there was no IFE box under the seat making for the feel of even more leg room compared to the return flight that had seat back screens with the IFE box under the seat. with the IFE boxes I had more space in 8F than my girlfriend had in 8E due to the placement of her IFE box and mine. the seat itself was a different story, horribly uncomfortable for the 4 hour flight, had i not been able to stretch out my legs im sure i would have been in some pain upon landing. If i were to ever fly on an AA B738 again i would for sure pay extra to be in Main Cabin Plus. First, American flying the 737-800 on transcontinental flights is just an insult. 6 hours on this flight in narrow seats with 31" pitch was long, however, I do recommend this seat as on the 738v2 it is misaligned to the window and does provide extract shoulder room if you recline the seat slightly. A small person was in the middle seat and I did not feel cramped. This seat is absolute hell. It's very narrow, and a structural part of the plane protrudes over the armrest and a good 2-3 inches into your seat space. Because this is curved, the taller you are the worse it is. I'm 6'4" and this is the worst seat I've ever had on a plane. The seat was comfy with plenty of leg room. The overhead storage was pretty tight. With no under seat storage. The food drink and service was very good. The internet was a complete waste of money. The internet service was slow or non-existent could not even send text messages on Facebook. This was the front row of seats in first class up against the bulkhead. It seemed to me to be a bit roomier and having a seat in front of me. It was a good flight from Dallas to Chicago on 18th March 2017. Flew MIA to St Kitts. A extremely uncomfortable seat for first class. It was an oversized economy seat. Like the review says, there are NO INDIVIDUAL SEAT VIDEO screens. You must bring your own device which is fine unless there is no wifi. Since our entire flight was over water there was no wifi available. I was not aware wifi was not available over water. I had no movies downloaded on my iPad thankfully I had books. Very poor seat with less legroom, due to bulkhead location, than a regular economy seat. Definitely not worth the $64.00 extra I was charged to book this seat. Sat in 11C on outbound flight for 1/2 the cost and was much more comfortable. No WINDOW!!!! Should have looked here first. I always choose a window seat. My fault but was highly irritated. 3A is the bulkhead row on this version and the legroom is excellent. I am not a fan of these seats that don't recline, they sort of rock back. I think the cushions are hard and uncomfortable for anything more than an hour, but admittedly I have little cushioning of my own. The IFE screen is quite large and the two windows are aligned. Good seat overall. This was the worst airline seat and the most discomfort I have ever had on a plane. I am 5'8" and 230 lbs, and was assigned this middle seat that has immovable arms. I didn't think I could squeeze into it, but I did--barely. I had very little arm room and sat with my arms crossed most of the time, so I wouldn't hit the people next to me..who also had little room. If my flight had not been only an hour and 10 minutes, I would have had to try and switch seats or take a different flight. All the overhead space was taken in the area, so I had to take my carry on to the middle of the plane. you aren't even allowed to put a purse under these row 7 seats because of "FAA regulations" according to the stewardess. It was awful and I will never fly a 737 with American again. While the seats are older, this means that reclining slides the seat forward while reclining you back. Although it is the bulkhead, this recline feature allows you to stretch out farther without feeling discomfort. Row 10 is to be avoided. It is the first regular coach seat behind the Main Cabin Extra seats in Row 9. They have a greater recline than Row 10, which means that there is almost no room left when they do recline. It was literally the most squished I have ever been on a plane. I am very small, as is my daughter (5'4" and 110 lbs) and both of us were in agony. They keep tightening seats -- at some point, mayhem will break out! I was actually impressed! Despite the reviews saying how old the plane was, I loved the seats! They were brand new but had no TVs like the other version of this plane. The only issue I had was that the wifi was painfully slow. Gogo seems to hate me with a burning passion every time I use it. Save your "Main Cabin Extra" money for something more worthwhile. Unless you're nice and skinny (I'm 5' 11", 220 pounds), these seats are ridiculously narrow. And 7A, being against the fuselage seems even more narrow. I had no room for my left arm and my shoulder was hitting the fuselage. Thank God my wife was sitting in the middle seat so I could use some of that space, otherwise I would've spent the flight with my arms between my legs. Legroom is OK, but the bulkhead will keep you from stretching them if you're over about 5' 7". I'm just glad my flight was only about 2 hours. Any longer would've been torture. Seat 9F is supposed to be Main Cabin Extra, but it certainly didn't feel like there was any more leg room than standard coach. my knees were making contact with the pouch in front of me, and that shouldn't happen in Main Cabin Extra. I feel ripped off and will complain to the airline. All coach seats on this plane are pretty narrow, closer to 17" as opposed to A320/321 which are closer to 18". Paying $80 extra for this seat was clearly not worth it. I'm pretty big, at 6' and 260 lbs. But this seat with the tray table in the armrest was to narrow for me and was extremely uncomfortable. It was so uncomfortable that I originally had this seat for the return, which I changed to a non-Main Cabin Extra middle seat for the 3 hr flight from DFW-EWR. This was the smallest seat I have ever sat in on a commercial airplane. There was in-seat entertainment but it was useless since it was about 8" away from my face. I am 5'7" and my knees were touching the seat back in front of me (which was fully reclined for the whole flight). Only a very small bag fit underneath the seat because of the electronics boxes. The seat pocket is now just a small mesh sleeve about the size of one iPad. The window was misaligned and very low (can't look out without bending way down, which I couldn't do because the seat in front of me was too close). I ordered a drink but had to hold it in my hand because the half-tray wouldn't even go down since it was so close to me. Terrible seat. I am not sure why you would pay extra for this seat. There is no additional leg room or width. Also, this flight from sfo to mia os configuration 2 for the 737. This row has a middle seat. Dont pay extra, there is nothing different about this row. I have flow on two variations of the 737. One older one (without the sky interior) and the latest and greatest one. I feel that the older the aircraft is the better the legroom is since its generous on the ones without IFE. Not so much the ones with IFE since I had issues trying to get my bag fully under the seat and the legroom was rather tight even in Main Cabin Extra. The notion of newer being better is not always true in this case. I'll stick with having a flight with decent legroom. Row 10 on this aircraft seems to be particularly tight, not just 10A. This seat has an outlet right where my left knee should be. Since I'm 6'5", this means I have my knees in the back of the passenger in front of me, who paid $200 for her extra space seat which she now can't recline. Neither of us are happy! This plane did have seatback entertainment. Consequently, my carryon (which fits under the seats of the regional jets!) had to be stowed in the overhead. Even though I have gold status, all the bins were full back to row 21! So, plan accordingly... you will NOT be able to fit anything bigger than a small handbag under the seat in front of you, and the minions of Platinum customers will take all the overhead space! Main Cabin Extra seat($79 each way).Leg room was fantastic.Noticed 7C and 7D had EXTRA leg room as the bulkhead is only halfway in front of them. This plane is great, the seats are great but are not the best looking. Power between seats did not work. For IFE download the American Airlines App to watch. Radio worked fine but was a little slow. I'm 6'4 and purchased Main Cabin Extra Seat 8C. This seat was comfortable for me. I was able to stretch my leg under the seat in front of me. Seat lines up with seam of bulkhead panel, not providing much elbow room. You'd better have a small tush to squeeze into this seat. The width is unconscionably narrow in the seat with the moveable armrest, but this seat is more narrow than that. I'll surely be Sponge Bob Squarepants by the time we land. Nice legroom, of course. 14A might be a better choice. This main cabin extra product is ridiculous. Seat pitch is nothing but economy! Why do we have to pay extra for 1/2" extra pitch. I just remebered why i don't fly this airline. This seat has the wall protruding into the seat. This limits shoulder room and is uncomfortable. Not only does it not have a window it is actually convex- protrudes out from wall. If you are slightly claustrophobic at all don't sit here! If 9a reclines his seat, you cannot even bend over to get your bag from underneath 9a. You better know 10b real well because your going to be rubbing shoulders with them. For a "main cabin extra" seat, this is not worth it. The window seat is closer to the wall of the cabin which creates a more narrow seat area. For the entire flight, my right shoulder was pressed against the wall and my left shoulder was pressed against the gentleman in the middle seat. I'm 5'8" at 200lbs and he was about the same height and about 180. I've never had so little lateral room, on any flight. Seat is narrow as tray folds into the armrest but, as my pet peeve on airlines is legroom, 14F had ample legroom and I was even able to put my backpack under the seat in front of me (some airlines don't allow this on exit seats). Don't pay extra for these seats. They are marked as main cabin extra but because they are bulkhead, the seat width is not like the others. Additionally the seat built is some strange, very thick device. Unlike some of the featured reviews ans this seat map, my seat does recline in the back of first. Comfy, plenty of room. My favorite part about any non-bulkhead in first is that most ipad covers can slide in there, you can hang it from that and watch movies while eating a meal or having drinks! On the aircraft that have been outfitted with the new seats with IFE screens included, the issue is not leg room. The top of the seat where the screen is bends out toward your face... when someone reclines, it's unbearable. I dropped something on the floor and had by face pressed against the screen on the seat in front of me, and still could not reach the ground. Flew from Seattle to Boston via Chicago, and found the seats to be perfectly comfortable. The food was good, and there were lots of services from warm nuts to a meal. There was no entertainment, which was a bit disappointing, however I brought my own. Compared to the Delta 737 I flew on recently, this was an unpleasant experience. Seats need to be updated for sure. American's wi-fi provides no flight data aside from the time until arrival (which was not very accurate). There is no complimentary entertainment available to watch over wi-fi, American only has free movies and tv shows on seatback IFE units, which are not on this aircraft. Maybe I'm used to the wide body jets but this was one of the most horribly uncomfortable flights I've ever experienced. It was hot - (small air vents barely worked), awkward window (you have to tilt head down to see out), the turbine engine is on the wing right next to this window which makes the whole area (including window) emanate an incessant deep humming/buzzing sound! Especially great if you want to sleep. The seats are rigid as iron slabs. It was cramped/barely any leg room and what's worse - these are "preferred seat"!? I paid $68 extra for 12A and 12B. Never again. The most legroom I've ever had. I could completely stretch out and I'm 6 ft tall. It wasn't any colder against the exit door. Too far from the drop down video screens to really watch anything. AC power at my seat is a real plus. This is in reference to the 737 V1 with the newer Sky interior. Seat 10F has a window, just a little bit in front of your shoulder. Also, I am not tall, 5'6", but the seat sits kind of high, so you have to bend your neck down a little to see. This is in reference to the 737 V1 without the newer Sky interior. Seat 12F has a window, but it is at your shoulder, which is good because your shoulder can lean in a little more against the wall. But, if you want to look out easy, it is not so great, as you have to turn your head quite a bit to see well. Also, I am nt tall, 5'6", but the seat sits kind of high, so you have to bend your neck down a little to see. This is in reference to the 737 V1 without the newer Sky interior. Seat 12A has a window, but it is at your shoulder, which is good because your shoulder can lean in a little more against the wall. But, if you want to look out easy, it is not so great, as you have to turn your head quite a bit to see well. Also, I am nt tall, 5'6", but the seat sits kind of high, so you have to bend your neck down a little to see. This was the most uncomfortable seat I have ever had. Paid extra for the leg room of exit row but seat was so narrow and upright that I arrived in Phoenix with leg and back pain. I rode on the new retrofitted plane from SMF to DFW and it was very comfortable. I'm on the shorter side so the leg room was quite nice and there were TV screens on the back of each seat with a large amount of choices for free. The leather seats were comfortable and a lot more cushiony than the older plane. Beware 10 A is not a window seat! The wall is several inches thicker forcing an average size person to wedge their shoulders between the wall and the person sitting in the middle. Paid $16 extra to avoid a middle seat in the back, guess what AA I want a refund. This is worse than the middle seat in the last row. Avoid this seat at all cost if you are on a long flight! 20 years ago, this would've been a standard economy seat. Worst "first class" seat I've ever sat in. Are the reclines, no way to sleep in this without being a contortionist. Fly something on Alaska airlines or JetBlue or Virgin America, at least they seem to care about passenger comfort. The seat is low and hard. Since the tray is in the armrest, it is too narrow for a larger than average person. Seat 6A, B do not recline. This is not relfected on the website for either version of this aircraft. Still pretty comfy. First class woohoo! Worst seat ever. Either it's the design of the seat itself, or all the padding was worn out. I can usaully sit anywhere without problems, but this seat was torture. Very little padding in the exit row window seat. Seat 19A has a misaligned window, so that if you are sitting in the window seat, you have less arm space b/c the wall pushes out more between the windows. My movement felt very restricted. 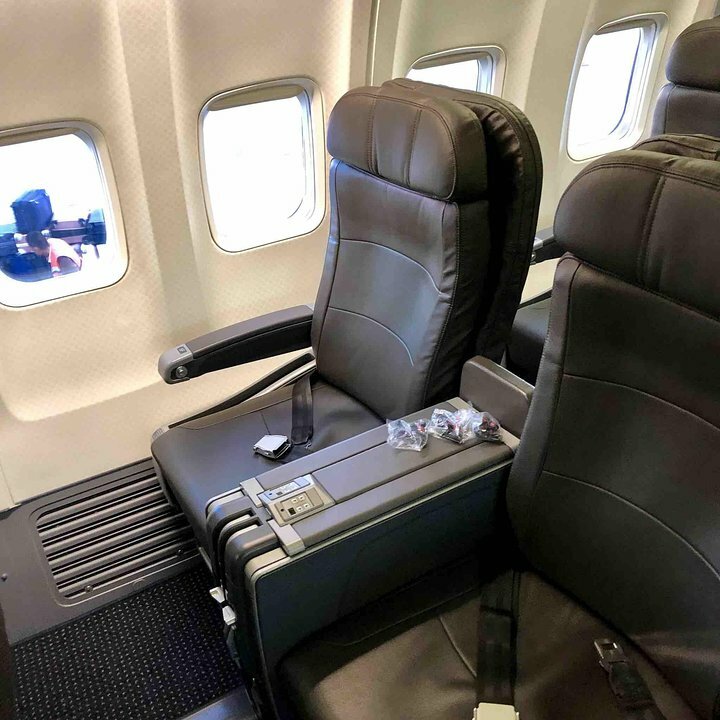 The seat positioning in this 737-800 aircraft deviates from prior seating design practices which left a gap between the interior body of the plane and seats in order to allow window passengers the ability to comfortably put their shoulder over the armrest. In this aircraft seats are pushed up against the interior of the plane body and as a result your shoulder hits the plane interior before you can comfortably center your arm over the armrest. My guess is seats have been shifted by almost 3 inches to the exterior of the plane. I'm not sure what this changed gained but I became acutely aware of what it took away. Due to the cylindrical shape of the plane body taller passengers will have less usable space. As a result I think all window seats in this aircraft should be coded yellow. Comfortable first class seat. Recline is not impacted by the bulkhead behind. The seat slides foreward when reclining. Power is available in the seat front. This exit row gives excellent leg room but the problem is the seat width is significantly reduced. I am not a big persob (womens size 8 or 10) and both sides of my hips are pushed against the immovable arm rest walls. Also very limited underseat storage. I have been flying for 40 years and this was one of the worst seats ever. Staff were great, but very unimpressed with plane. First class had no individual entertainment system. Should be standard. All pics showed it. Flew DCA-DFW. Very good legroom, but unable to recline because of the exit behind. Seat is also very narrow. I was booked on an MD80 but the aircraft was changed to this 737. Without doubt 10A is the worst seat I have ever been in - it is horrible. Why is there no window? Why would Boeing design a window seat with no window and more to the point why would an airline buy it! It is so claustrophobic. Also I agree with a previous comment it is very narrow. I love Boeing but the AA 737-800 is a shame. MC Extra seats are a joke. I would hate to have to sit in Main Cabin based on this. Only a short, 3 hour, flight and I can't imagine being transcontinental on this plane. Luckily there were some other seats that were open I moved from the center seat to another row. We returned on an A321 and it was sooooo much better. This seat does have good longitudinal leg room, but the curvature of the aircraft limits foot space slightly, side-to-side. On descent, the AC unit has condensation that leaks through the emergency exit release handle cover, and drips on one's arm. Attendants said it's endemic to the 737 line. For a tall person (I'm 6'4") the window is too low to enjoy, making B and C the better seats. 4.5 hr flight from ORD-LAX last night. 30 min delay on ground, and still no beverages offered in 1st class. I actually didn't get a drink until I was in my seat for 1.5 hrs. I hate to be whiny, but I didn't think 1st class passengers needed to bring their own beverages aboard. Seat was comfortable. But no leg rest, no individual TV, food offering was warm stale nuts, and a chocolate chip cookie. Seriously. Definitely avoid this version of 737 if you can, I was upgraded w miles, but had I paid big bucks for this seat I would have been bummed. Horrible flight due to the plane being so old that it felt like it was going to fall apart on take off and landing. We had no weather to deal with at all, but the plane honestly felt like it was being twisted like a plastic toy. People were screaming out of terror as we landed. Beware the claims by American of their "new" planes, because you'll just get stuck on these and be hating it. The seats are fabric and have no entertainment options. This was my first experience with American Airlines, and I was very disappointed by the experience. First, the seat belt was attached wrong so that it would tie around once. Second, the power outlet was located below the armset, which made it very hard to charge my laptop. Several times I had to crouch down and reconnect my charger. The good thing was that they seated my family in a Preferred Seat. After the flight, I realized that my seat was reserved for AAdvantage members. However, it was my family's first flight on American Airlines. We did NOT have a AAdvantage, but American Airline automatically reserved this as our seat. Overall, the experience was "Poor". Next time, I would rather use another airline. In addition to the narrower seat due to the table being in the armrest, the seatbelt also contained an airbag which also diminished the width of the seat. AA considers this seat a premium seat because of the extra legroom at the bulkhead. I rate it the worst seat I've flown in during my 55+ years of flying! The power outlets are located below the seat cushions in the standard Economy seats. In this position, they are nearly impossible to use. You have to be a contortionist and use a flashlight to find the outlet for your seat, because there is so little space between you and the previous row to maneuver and it's dark down there. To add insult to injury, after a managed to get plugged in, it failed to charge my iPhone. 7A,7B,7C,7D,7E, and 7F are all rated as premium seats. There is a partition between these seats and first class which severely limits leg room. All of these seats should be rated poor to unacceptable. I was quite surprised by how much I disliked this plane. Being a US Air vet, I do like that AA has the main cabin extra option. At first I was impressed by the TVs, but that quickly disappeared. First, the entertainment box in my underseat space took up so much room that my laptop bag couldn't fit. I felt bad taking up precious overhead space, but nothing I can do. Then I realized the stupid TV was PPV only. Shouldn't spending hundreds on a flight get you a couple free movies? Horrible layout, and a huge disappointment as a semi-premium offering. Do not choose this seat if you want a window view. We paid extra for this row, but all I could see was the blank wall. This is not just a mis-aligned window. It is no window at all. This is the one time I did not check SeatGuru, and I regretted it. we had V1 737-800, first flight row 17 D & F (aisle-window)..leg room was just a little more than seats further back, but did not have limited under seat space in either. Second flight had row 9D & F. These seats had a little more leg room and still had storage for a normal backpack under seat in front. I took a shawl to put at my back for support, but used it for a little extra warmth through the flight. Seats are not luxury, but not totally uncomfortable. we are both slender and normal weight (no one over 160). I am petite (5ft3) and my partner is tall (6ft6)..his legs were close to seat back in front of him in row 9, but not totally uncomfortable. he wound up using part of my underseat to stretch his legs out. Very uncomfortable experience in Cattle Class. The aisle seat back is too upright and the shape of the cushion and seatback is not comfortable. My seat on the MD-80 was significantly better. The person in the middle seat had so little space to use his computer that he poked me in the shoulder every 10 seconds. Inhuman conditions for more than 15 minutes. This seat should be a yellow or red. This was the most uncomfortable 737 seat I've ever had (usually fly United). The rib of the plane caused me to have to sit on an angle from LAX-MIA. And I paid extra for this torture! Extra leg room? Compared to what? These seats are very cramped. so disgusted at the level of product offered for this long haul to Vegas from JFK. Flying first and the product is the same mediocre level as you would get on an east coast short haul. Cloth seats, no in seat entertainment system, old plane.....not pleased at all. Very unimpressed with this Main Cabin Extra Seat. According to Seatguru now, it has about 4-6 more inches of pitch than the regular economy seat. WRONG! The pitch was way more cramped than I though it would, it probably has about 2 more inches of room than regular economy. Luckily, I was on a short flight, I don't recommend it for the long haul. Would get aisle seat if you really want room, pretty disappointed. Seat Guru should note that window seats on this plane are 1" narrower than middle and aisle. I physically measured the seat back using the provided magazine, the only thing it is good for. I also agree with other comments that these seats are extremely uncomfortable for all but the smallest passengers. The backs are curved, offering no lumbar support, with the padding ending in a lump below the headrest. Anyone over 5'-6" gets this lump right across their shoulder blades. Terrible. First class lavatory on Boeing 737 so small an average-sized person can barely stand upright or turn around. Location to left of plane entrance a bad decision. Seat 3A not very comfortable. Meals were really bad--feed well and have a happy flyer. Experience not worth first class fare. Every economy-class seat in this plane should be graded yellow or red. The entertainment-equipment boxes mentioned in the notes as "may restrict underseat storage and legroom", in fact leave barely enough room for ONE leg, OR a small carry-on item. For two-legged adult passengers, these seats are simply unacceptable. I presume there was a concern that American would file a lawsuit against SeatGuru if these seats were fairly graded in the infographic, but if you want to be of service to the traveling public you do need to address this sort of thing with more than a footnote. I could not believe that I was on a plane from Charlotte to LA that was this uncomfortable. I normally fly Delta, where the leg room is reasonable. If these are the kind of planes that AA is using, I will not be flying with them again. Oh, I forgot to mention there was not entertainment available. Really? A coast to coast flight? Poor aircraft choice by AA for a coast to coast flight. Not at all worth the price for a first class ticket. No real amenities as on newer aircraft. Dont bother. This was the worst seat I have flown in for 10 years. Rib of plane hits you in the shoulder area, seat is really narrow and short and pitch seems off. Just very uncomfortable on a seat for which you pay extra. Flew on this plane from ORD to SFO (although I don't remember which version) and back. Legroom was good, but I am smaller than average (about 5'1"). The seat space underneath the seat was just enough to push in a rolling backpack. The chicken salad I had for dinner was just so-so, so I didn't order anything else. The movie on the overhead screens was "The Theory of Everything", which I wasn't able to hear because the volume was either too low or too high when I plugged my earbuds into the armrest port. Even though I was right by the engine, the noise level inside the cabin was somewhat quiet. I would recommend this plane, however bring your own food and entertainment, there is no entertainment system for every seat and the food served was either soggy or huge in portion size. This seat is the worst I've ever flown in. To begin with, I'll never fly transcon on an AA 737 again, as American really crams in the passengers and there simply is no comfort. Seat 9F is misaligned with the windows, and you have the rib support structure protruding into the area where your right shoulder is, so you are forced to lean in to the passenger next to you. You cannot use your right armrest comfortably and you can't lean onto the window to rest your head and sleep. If this were a short flight it wouldn't be so bad, but 6 hours of this made for a miserable experience. I paid extra for this seat to get a few more inches of legroom, but the rib structure pressing against my shoulder more than negated that benefit. Flight date: Oct 13, 2014 9:45pm The seat 5E in first class is comfortable and also is third row seating. No personal entertainment, just the old fashion drop down screen. The service from MIA to BNA was nothing special. Usually during boarding the crew ask and serve drinks while boarding, not on this flight. Crew were too busy talking among them selves and service started during flight. Also no lounge permission with first class ticket in Miami as they told me only for international flights. Really? American Airlines should feel ashamed flying a plane like this. For a bulkhead seat there was no added legroom, which I would have expected. However, I was able to stretch my long legs out into the First Class cabin, but that meant each time the flight attendant opened the curtain (which was quite frequently) between First and Economy I was disturbed. I could barely see the overhead inflight entertainment from my seat. By the way who still only has overhead inflight entertainment on a 5-hour flight from LAS to JFK? This is a standard Buss Class seat on an older plane. Has plenty of room and a few extra pop up platforms to put drinks on. The trays are very small. Overhead screen. as usual on these you miss a lot of the dark scenes in the movies. No choice of movies of course. The flight attendants were to busy catching up to offer anything when you sat down. Made a face when I asked for a glass of water, and eventually gave me room temp water. "trying to load the flight, can't access the ice". Also - no Lounge access (Mexico is not considered International) and this was on a paid ticket. They charged it as International! When I found out I would be flying on a non-Sky Interior 737, I was disappointed, but for no reason I later found out. 11A was a comfortable MCE seat with a perfect window and a great view of the overhead TV. My ideal 737 seat from now on. Excellent leg room and under-seat storage. Recline without affecting space of pax behind. IFE is a shared drop down...rather than personal...a bit disappointing. I was shocked at how old this plane was and, considering the fact that I was in "first" class, a HUGE disappointment for a 4+ hour flight. The seats were okay but nothing special-- only a bit roomier than the extra legroom seats in economy. There's a HUGE difference between flying business class on an international flight and on this domestic aircraft. There was no choice of movie on the overhead screens, the food was the worst I've had in a long time. It was similar to the meals that used to be free in economy class--everything served at once --choice of a pasta meal or a chicken dish-- that was it! Dessert consisted of a piece of cheesecake-- no choices at all. The flight attendants were inattentive, too "busy" to smile and seemed annoyed at the smallest request. This really was an insult to AA's customers. Most uncomfortable seat - people are larger, yet AA orders smaller seats. What a difference between the USAir A321 we had down to CUN and this strangler! Bathroom was fit for a child - Boeing, please have real people sit in your seats and bathrooms when you design them - I will check seatguru before booking a flight - new isn't always better - look at how comfortable the old SWest planes are! Paid extra for more knee room (which was correct) but panel in front of seat extends to floor so could not extend my legs like under a seat. For me this was actually worse seat than one where I can extend my feet under the seat ahead. Exit row window seat cushions are thin and harder than center and aisle cushions. Misaligned window means to your left side, there is a wall that juts out further towards the seat than a normal window. Reduces the amount of space significantly. Terrible seat. I'm a fairly tall (5'10) and large (380lbs) woman. This seat was as comfortable as it could be. The armrest were moveable. I did require an extender.